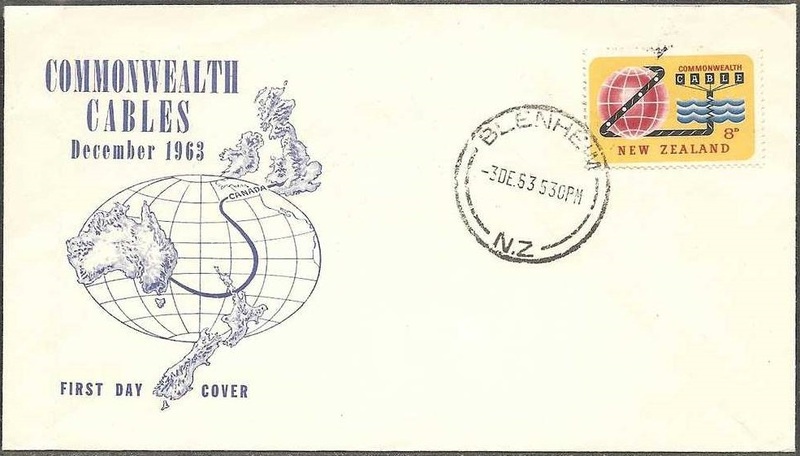 Virtual New Zealand Stamps: 1962 - 1963 Communication Centenaries. 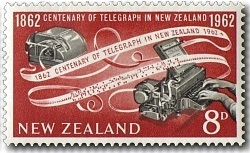 This stamp issue celebrated the centenary of the introduction of the first telegraph service in New Zealand. 3d - Hand Operating Morse Key. 8d - 1960s Teleprinter & Teleprinter Tape. Edward Dobson (born 1816) was a civil engineer who was one of the original purchasers of Canterbury Association land. He emigrated to New Zealand in 1850. Described as a man of ‘strenuous action’, he was Provincial Engineer between 1854 and 1868, during which time he attempted to confine the Waimakariri river within its banks to stop flooding in Christchurch; supervised the draining of 10,000 acres of swamp land around Rangiora; designed and supervised the construction of the breakwater in Lyttelton Harbour and supervised the establishment of the railway system throughout Canterbury. 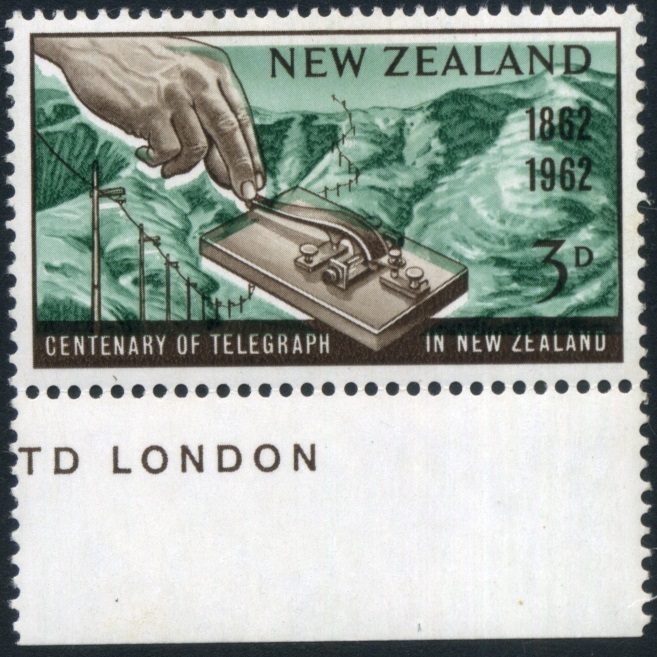 Dobson planned and introduced New Zealand’s first telegraph circuit which was operated for the first time on the 1st of July 1862. 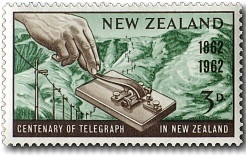 The telegraph line ran over the Port Hills which separate the port of Lyttelton from Christchurch and was operated from the Police station in Lyttelton to Christchurch Police Station as is shown on the 3d stamp. 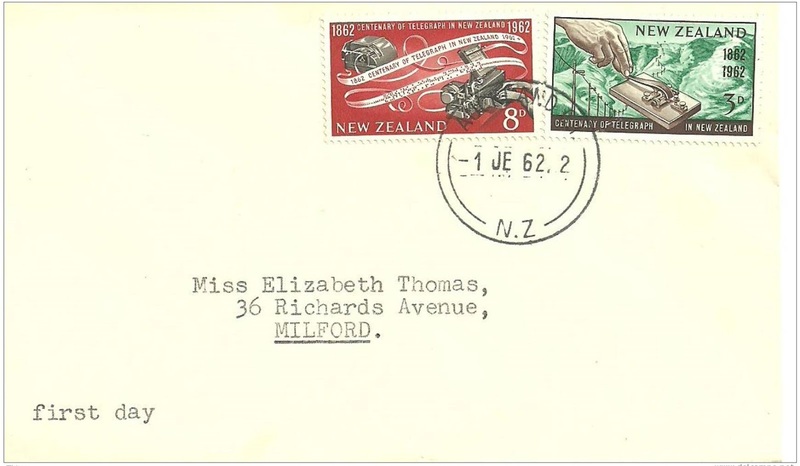 This stamp was designed by A G Mitchell and was issued by the Post Office one month early on the 1st of June 1962! 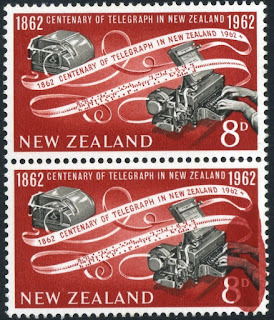 The 8d stamp was designed by A.G. Mitchell's father L.C. Mitchell. It features a 'modern' 1960s teleprinter - most likely a Series 1 Siemens Halske Teleprinter Model 100 which were manufactured in Germany and sold internationally in the early 1960s. These machines were well built and incorporated many advances in post-war technology. The model 100 included the new PMG Telex Service for businesses which were able to connect directly to each other via teleprinter both nationally and internationally. Printed First Day Cover. (Unaddressed). 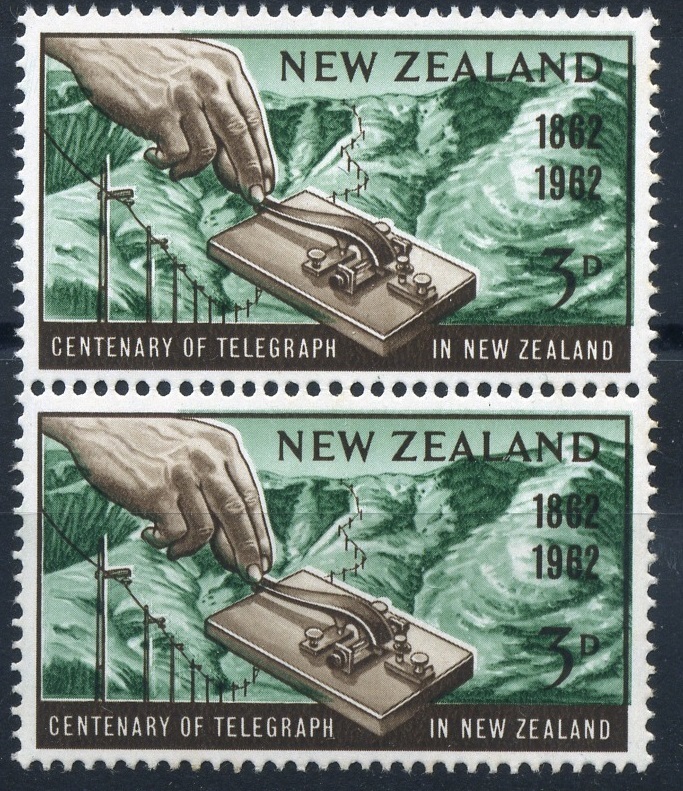 Left-hand Pair - 1962 3d Telegraph stamp with green shift to upper right. 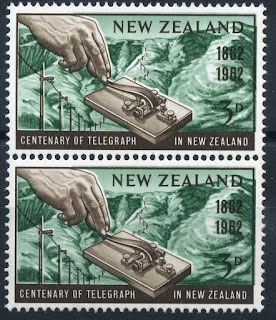 Right-hand Stamp - 1962 3d Telegraph, showing major green colour shift downwards. 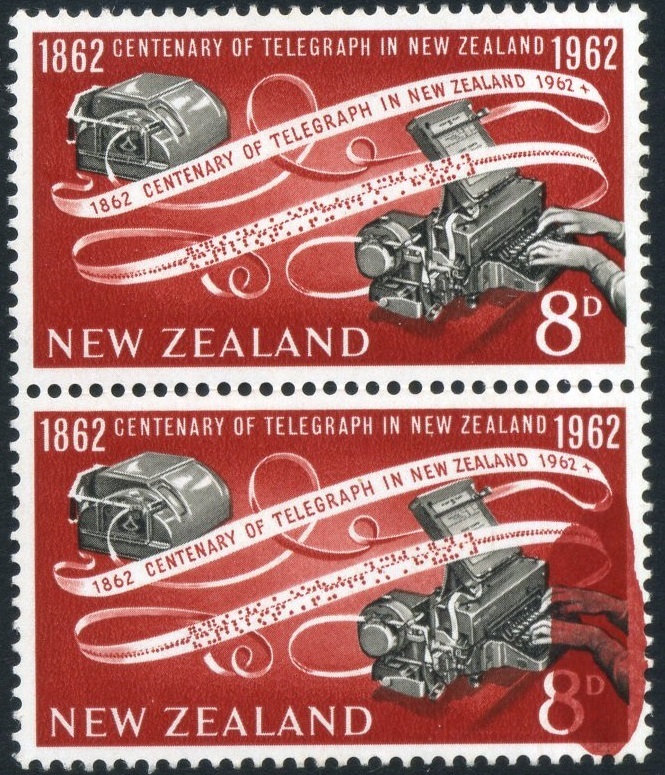 Left-hand Pair - 1962 8d Telegraph Stamp pair with major red ink flaw on the lower stamp. 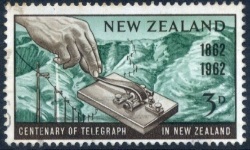 Right-hand Stamp - 1962 8d Telegraph stamp with black colour shifted upwards, which creates a white key-line around hands & machinery and a dark shadow above each item. 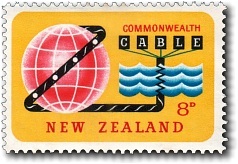 1963 Commonwealth Pacific Cable Opening. 8d - Commonwealth Pacific Cable. The stamp depicts the cable encircling a globe and continuing through symbolic ocean waves. 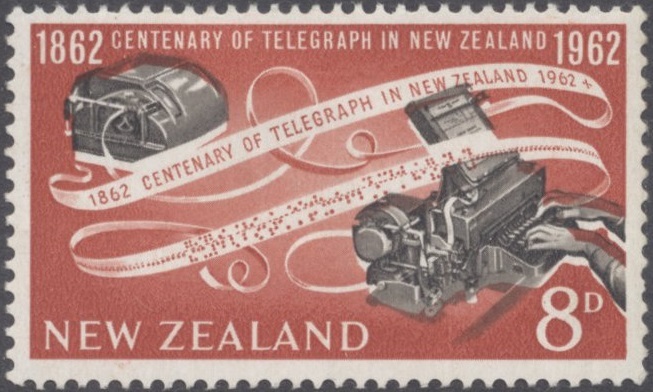 The Overseas Telecommunication Commission in Australia approached the Australian Post Office with the suggestion that a special stamp be issued to mark the opening of the Commonwealth Pacific Cable. The cable linked Australia and New Zealand with Canada and Great Britain. The matter was raised at a meeting of the Pacific Cable Management Committee where it was agreed "that each partner be encouraged in achieving this object in his own country". In view of the short time available it was decided that a common design could be used to advantage. 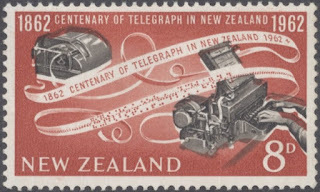 An Australian stamp had already been designed and it was decided to use the same design and printing arrangements for the New Zealand issue. A slightly modified version was adopted by Great Britain. 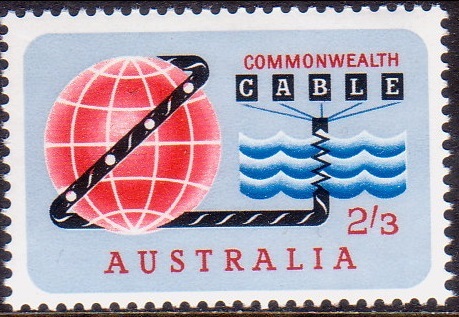 Commonwealth Pacific Cable - Australia. 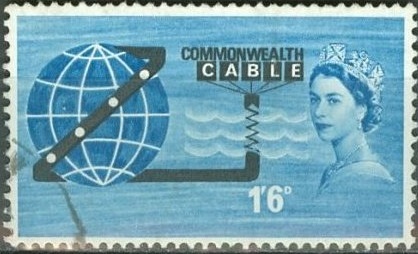 Commonwealth Pacific Cable - Great Britain. Technical information - 1962 Telegraph Centenary. Now that was interesting. One stamp designed by a father the other by his son. That is not the only time where the work of these two designers appeared together. In the 1990 Treaty of Waitangi miniature sheet, the sheet was designed by A. G. Mitchell using an original water colour painting by his father L.C. Mitchell. I am unsure if Len Mitchell had any part of the design other than the painting. 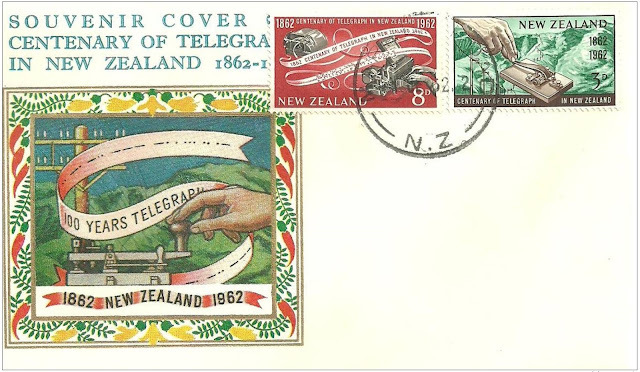 There could be other examples too as both man designed a great number of New Zealand stamps. Yes Allan, I checked that one out too. Another father/son effort. I wonder how many more there might be. You could do a page on various stamp designers. Maybe a series of pages. I know of at least four stamp designers we could write about. There will likely be a few more too. A series of posts, each tell a bit about the designer, then we show a selection of his stamp and you can comment on his style Allan.